My Grandma Howard used to say — chortle, really — ‘I’m rich,’ when referring to her six grandchildren. Funny, because she was a mostly unsentimental person about family and everything else (and also because she was rich, money wise). I’m reading a book* about a man who has suffered a violent assault and is recovering at home, full of pain and rage, his memory addled. All he wants is to return to what was once so unremarkable he was entirely unseeing of it: his ordinary life. He wants to be just a man putting on his jacket before leaving for work in the morning, stopping to rinse out a coffee cup and check his pocket for keys. Unremarkable except when it’s all gone and you no longer have a job to go to or the ability to make coffee or the dexterity to use keys or the mobility required to walk down a sidewalk on your own. I read in this both a caution and an invitation. Notice all these things, they are not yours forever (the bad news). Don’t dismiss your ordinary blessings because you’re too busy wanting other things. Also (and the good news): while you have them you are rich indeed. I know “late blooming” mostly refers to an adolescent’s delayed development but this time of year, it puts me in mind of paper whites, which I like to grow during the weeks before Christmas. I started a few pots of them early in December but in our cold and dark house — kept this way because no one is ever home — they seemed delayed in their development: stumpy and gnarled like fetuses, like bulbs (which are flower fetuses, you could say), only loosely rooted in their cold beds of stone and dirt. More like graves than beds, come to think of it. But then the holidays were truly upon us and I filled the fridge with food and the kids filled the house with messy bags of their stuff and carols filled the air and there were packages wrapped in bright paper and fires in the hearth and Christmas cards stacked on a silver tray and stockings hung with care. 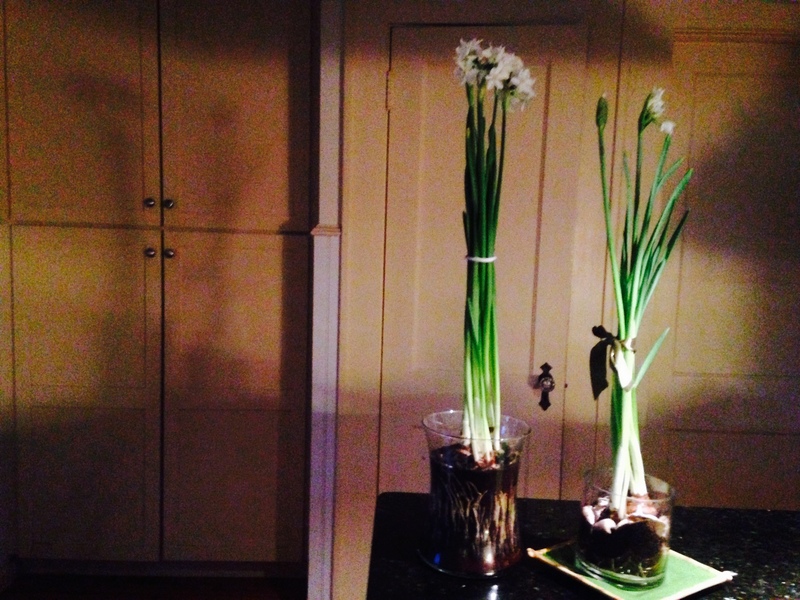 And in response to all this, the paper whites bloomed. Or maybe it was just because we finally turned the heat up. There’s a secular kind of prayer I make when I fear something in my life is about to be lost. It goes like this: please, please, please, please. As a mother of two “children,” now in their twenties, I’ve had far too many occasions to send up that prayer to another Maker, who, although not well known to me, probably doesn’t reside in Cupertino. Please, please, please, please, I would think as I pounded the playground looking for a lost Lily, who was not over by the swings, not underneath the life-sized concrete hippos, and not where I last saw her at the teeter-totters, before I fell into a conversation with another mother, complaining about our kids, in all likelihood. When Lily is found — trolling for food from the sanctimonious mom who always remembers to bring baggies of raisins and Goldfish — I don’t care that Mother Superior gives me a side-eyed look for losing my daughter and having no snacks. I send up a thank you to Whomever for restoring Lily to me, for making this day a perfectly ordinary one. I remember, at least in that moment, to stop wishing that extraordinary things would happen to me (“Hey lady, you look like a novelist! Got a book we can publish?”) and appreciate just how sweet ordinary life can be. Fast-forward many years and Oliver, Lily’s younger brother, has offered to drive to Vermont to pick up his sister from college. It is Thanksgiving break and we are too cheap/broke to fly her home. As darkness is falling, some five hours after he should have arrived, Lily calls to say: “No Oliver.” I try his phone, which goes straight to voicemail but I don’t really worry until Lily calls two hours later with the same message: “No Oliver.” I try to go about my ordinary activities, shopping for the holiday, but my brain is scrambled with anxiety, and the grocery store is making me more nuts than usual: the bafflingly numerous choices when it comes to buttermilk, the throngs of shoppers in that supermarket-stupor of torpid movement, the grocery baggers in their grating Santa hats (it’s Thanksgiving people! If you feel you must wear a holiday topper, why not a pilgrim’s hat?). I am blinded by visions of Oliver, all of them catastrophic: car crashed into a tree or car out of gas and he’s walking down the road accosted by a crazy person or forced to sleep in the car, temperature plummeting, his vehicle black by the side of the black roadway, an obstacle the other car can’t see until … and so forth. Please, please, please, please, I think, praying, in my way, for my ordinary life to resume. And it does, with an annoyed Oliver calling from a gas station up by the Canadian border, having missed his exit, having had his cell phone die, having had to listen to ten (he: “seriously, mom, ten?”) increasingly frantic messages from me. The next day I am still weak with relief over having both my children — and many other people I love — around the table. And even though the turkey is on the dry side and the gravy is on the thin side and the biscuits are a little weird (wrong buttermilk) and the cranberry relish is hated by all, I couldn’t be more grateful when my guests compliment me on the lovely meal. 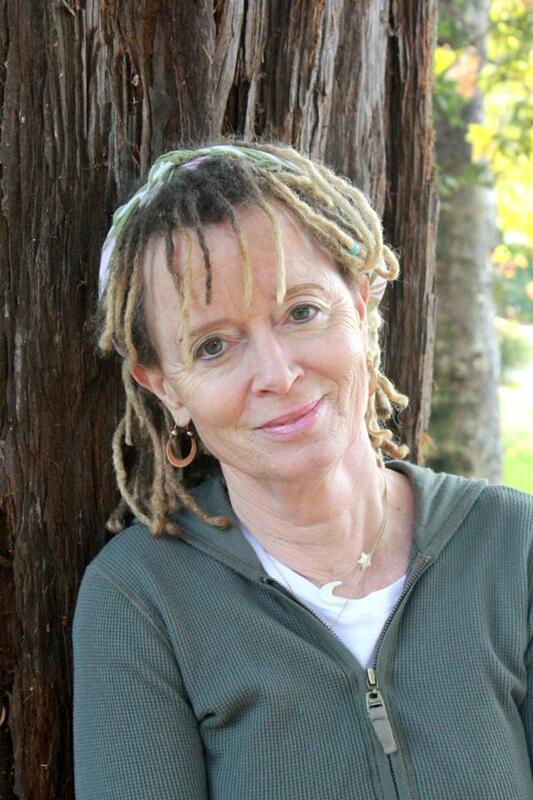 Anne Lamott at some age, doesn’t matter, because she is so beautiful. I love Anne Lamott. Bird by bird, the most encouraging essays for spurring on writing. Traveling Mercies, for feelings about faith. Crooked Little Heart, for its every page. Once, with Merrie, we tried to find her house in Fairfax (I think, upper Marin anyway), driving around, looking for a wiry white woman with dreadlocks. My heart is not any age. It is a baby, an elder, a dog, a cat, divine. This business of being a human being is infinitely more fraught than I was led to believe. When my son Sam figured out at 7 years old that he and I were not going to die at the exact same moment, he said, “If I had known that, I wouldn’t have agreed to be born.” That says it for me. It’s hard here, and weird. This is the last Saturday of my fifties. The needle isn’t moving to the left or to the right. I don’t feel or look 60. I don’t feel any age. I have a near-perfect life. However, I grew up on tennis courts and beaches in California during the sixties, where we put baby oil on our skin to deepen the tan, and we got hundreds of sunburns. So maybe that was not ideal. I drank a lot and took a lot of drugs and smoked two packs of Camels (unfiltered) a day until I was 32. I had a baby and then forgot to work out, so things did not get firmer, and higher. So again, not ideal. My feet, however, frequently hurt. My skin broke out last week. I filed a new brief with the Fairness Commission, and am waiting to hear back. My great blessing is the capacity for radical silliness, and self-care. I’m pretty spaced out. I don’t love how often I bend in to pull out clean wet clothes from the washer, and stand up, having forgotten that I opened the dryer that’s above, and smash my head on the door once again. I don’t know what the solution to this is, as I refuse to start wearing a helmet indoors. I don’t love that I left my engine running for an hour last week, because I came inside to get something, and then got distracted by the dogs, and didn’t remember I’d left the engine on. It was a tiny bit scary when a neighbor came to the front door to mention this, and I had to feign nonchalance, and act like it was exactly what I had meant to do all along. I backed into an expensive truck in the parking lot of Whole Foods last month. Boy, what an asshat THAT guy was. My bumper had fallen off in the mishap, and I had to tie it back on with the shoelaces from my spare running shoes. Sigh. Wednesday, the day before I turn 60, I am having a periodontal procedure that Stalin might have devised. How festive is that? But that night, my grandson and niece will pelt me with balloons, and we will all overeat together, the most spiritual thing we can do. Mentally, the same old character defects resurface again and again. I thought I’d be all well by now. Maybe I’m 40% better, calmer, less reactive than I used to be, but the victimized self-righteousness remains strong, and my default response to most problems is still to try and figure out who to blame; whose fault it is, and how to correct his or her behavior, so I can be more comfortable. My friend Jim says, “I don’t judge. I diagnose.” That’s me. Spiritually, I have the sophistication of a bright ten year old. My motley crew and my pets are my life. They are why I believe so ferociously in God. Politically, I am still a little tense. I love that Obama is president. I love Obamacare. My great heroes at sixty are Gloria Steinem and Molly Ivins. Forgiveness remains a challenge, as does letting go. When people say cheerfully, “Just let go and let God,” I still want to stab them in the head with a fork, like a baked potato. This business of being a human being is infinitely more fraught than I was led to believe. When my son Sam figured out at 7 years old that he and I were not going to die at the exact same moment, he said, “If I had known that, I wouldn’t have agreed to be born.” That says it for me. It’s hard here, and weird. The greatness of love and laughter, the pain of loss, the bearing of one another’s burdens, are all mixed up, like the crazy catch-all drawer in the kitchen. This doesn’t really work for me. If I was God’s West Coast rep, I would have a more organized and predictable system. So we do what we can. Today, I will visit a cherished friend post surgery, and goof around with her kids. I will try to help one person stay clean and sober, just for today. I will loudly celebrate my own sobriety, and also the fact that my writing has not been a total nightmare lately. I am going to go for a hike on these sore feet, and remember Gerard Manley Hopkins, “The world is charged with the grandeur of God.” Charged, electrical with life’s beauty and light! Wow. Then I will probably buy the new issue of People magazine to read on the couch before my nap, and a sack of the black plums at the market that seemed overpriced yesterday, but not today. 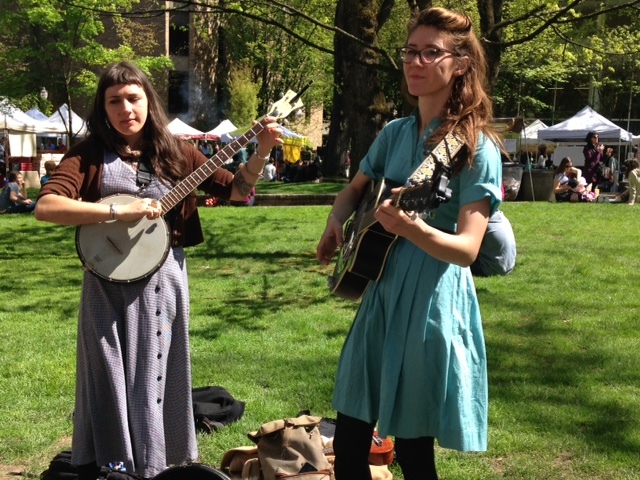 This has been a charmed weekend in Portland. My visit coincided with the city’s first spring-like weekend, weather that brought on bursting cherry blossoms and new-green leaves and people going barefoot (maybe they do this in any kind of weather; I think they do, in fact ) and singing tunes on the street corners, accompanied by ukeleles. I am sitting outside on a second-floor balcony, waiting for by bubble tea. Iced, ginger, green. What the bubbles are, I do not know. I have been thinking about a concept I’ll “displacement,” thanks to Delia Ephron who made me realize other people feel this too. Essentially, it’s the feeling that whatever you’re doing and wherever you’re doing it, you wish you were doing something else, somewhere else. More complicated than that is that you don’t wish at all — rather, you wonder if you should be otherwise and elsewhere occupied. Frustrating, isn’t it, when not even what you want is clear to you? For instance, working inside on a Saturday you think you’d be better off outside playing, but if you were doing that you’d feel guilty about not working. Out at night, you want to be home in your jammies; in at night, you want to be at a swanky party like everyone else. Exercising, you’d like to be doing anything but. Not exercising and that’s exactly what you should be doing. If you don’t know what I’m talking, read no further. I don’t want to infect you with this kind of thinking. Dog in the hot weeds is from a poem that Merrie gave in a card on my birthday the year before she died. I looked for it last weekend (when I found the letter from Gladys). I can’t recall the line but it said something like “the dog in the hot weeds doesn’t think he should…” An extremely weak support for why the “dog” poem is just right for this feeling. But Merrie gave it to me and we talked about it and I want to stick with this little piece of what’s left of it (and her). Suffice to say, in Portland, in the springtime, with the sun shining through pink-blossomed trees, drinking iced ginger tea and writing and thinking about Merrie … there’s no other thing I’d like to be doing right now and no other place I’d like to be doing it. 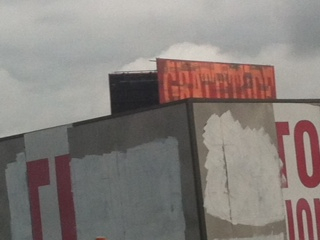 There’s this sign in the Bronx that looks to be advertising gratitude. I pass it on the train at a point when I am pointedly not grateful for being on the train (I have a two hour commute). Last ride home, I was reminded of some sort of gratefulness project wherein I was asked to make a list of 50 things for which I am grateful. Won’t you tell me yours, dear reader?